Battle of Queenston Heights | Where is Here? One thing preoccupied me during the battle: what are they thinking? 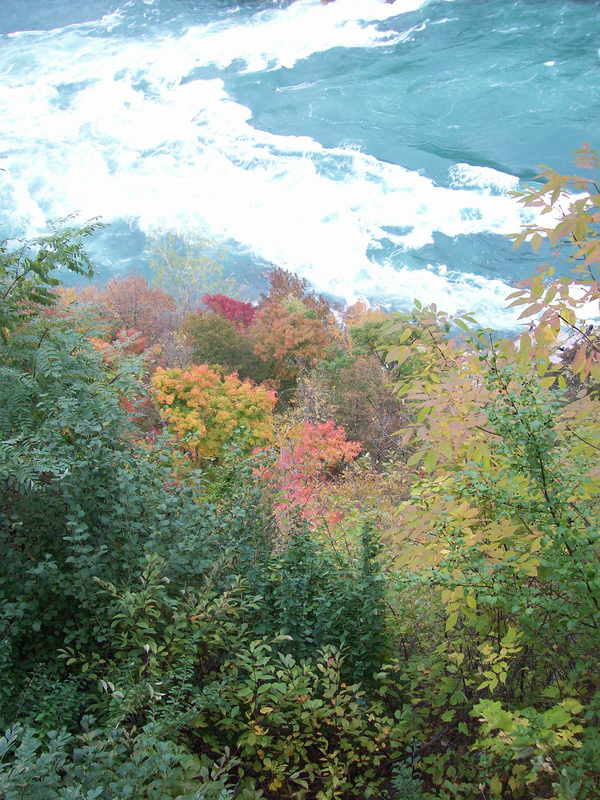 The Niagara River in its brightest season. October 2012. Reasoning that it qualified as dissertation-research (for me, that is), D and I drove down to the Niagara Peninsula last weekend to watch the re-enactment of the Battle of Queenston Heights. This event was part of a huge, national project to commemorate the 200th anniversary of the War of 1812, with events planned all around Ontario and Quebec for the next two years. There will be fancy-dress armies, historically-accurate food, tall ships, sea-battles, red-coats, poke bonnets. Laura Secord. Tecumseh. General Isaac Brock. The events are spectacular, and expensive, equal parts educational opportunity and vacation plan. Second Brock Memorial. First Centenary. 1912. Last May D and I drove south to the Niagara frontier to see the Corpse Flower in bloom at the Niagara Floral Showcase and to visit Queenston Heights, because I’m working on a chapter about the battlefield. The Corpse Flower gets its own post, though, as a kind of footnote. Queenston Heights is a park that was once a battlefield. You know it was a battlefield because there’s a very large monument to Sir Isaac Brock, the English General who led British and Canadian troops against the Americans in October 1812, and who died early in the battle. The memorial tower rises aggressively on the Canadian side of the frontier, with Brock at the very top, pointing toward the American side of the river, as though the tower isn’t only to remind us of the general’s death, but to tell us where and how to look toward his American enemies.